Flap Discs - ARC Abrasives, Inc.
Flap discs are a 3-Dimensional abrasive product. They consist of abrasive flaps glued radially to a backing plate. As the product is used the abrasive wears down and new abrasive is exposed underneath. Zirconia is the most common mineral for flap discs due to its cool cutting action. Ceramic is sometimes used but the price usually cannot be justified for the small performance increase. Flap wheels are for other various applications. Hard edge discs have a shape similar to our Type 29, or angle faced discs, but are engineered for extremely fast material removal using a reduced amount of pressure. This is accomplished by compressing the outside rim of the flaps to eliminate flexing during the grinding process. 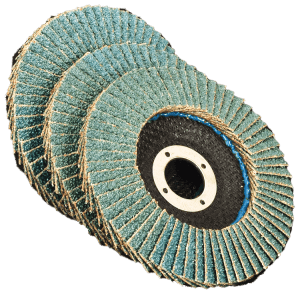 Ordinary flap discs can flex over the work surface causing grains to shell or shed prematurely, resulting in longer grind times and shorter life. Hard edge discs provide a faster cut and longer life in coarse grits because they retain the abrasive grains so well. 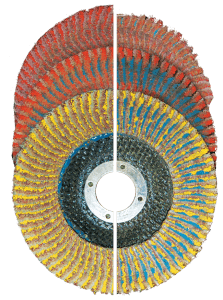 Flap discs provide the added benefit of finer finishing after aggressive grinding, compared to resin fiber discs. The dimensional layering of flap discs allow the continual exposure of abrasive grains, versus one layer of grains. Flap discs contain just as much working surface as resin fiber discs, but within a much smaller diameter. This geometry is responsible for the versatility of a flap disc. The integrated grinding aids utilized in PREDATOR™ materials help with longevity and cooling. 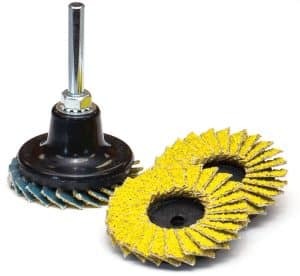 Flap discs provide aggressive material removal on all metals, but lack access to tight areas. Like quick-lok discs, mini flap discs can reach small areas in need of grinding but suit the needs of heavy material removal. Mini flap discs are used with a Type S Quick-lok Disc Holder, retaining the time-saving changeover of quick-lok discs. From aggressive grinding to fine finishing with the benefit of a small diameter. 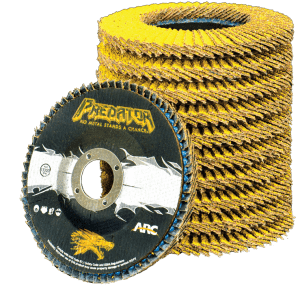 PREDATOR™ Mini Flap Discs are an extremely versatile product. An excellent general purpose abrasive, ideal for use on steel, aluminum and composites. The cotton backing adds strength and durability to a very competitive product. 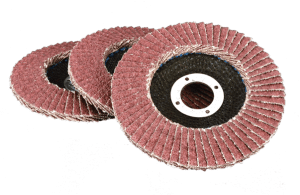 Especially suited for use on stainless steel or cold rolled steels, aluminum oxide flap discs are self-lubricating to avoid overheating of the work piece. The size coat and top size coat also aid reduced clogging and improve the resulting finish.